The author grew up in Oregon – and the illustrator grew up in Prague. 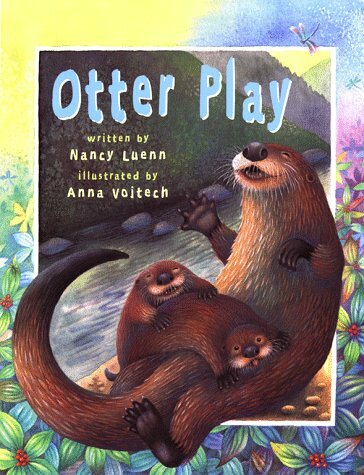 But in 1998, they teamed up for Otter Play, capturing “the joyful magic of the river otters’ day” (according to the dust jacket), “and of the child who watches them. The illustrations are simple – but effective. Yellow sunshine reflects off a river and tints the colors of the mountain, while the picture magically shows the inside of an otter burrow, where an otter family sleeps cozy in the straw. “They nip each others whiskers,” writes Luenn. A little boy stretches his arms to the sunlight – as inside the burrow, a waking otter stretches its paws. The river is lit with morning colors – white rings around the otters who surface in the water. The otters slide through a cool, damp tunnel into the river – just as the boy’s family slides their boat into the river from the other bank. The book alternates between the otter’s viewpoint, and the family’s. The otters see the people, and the little boy watches “the otters watching me.” There’s even a drawing of the otters swimming under the water – and on the next page, each otter mouth holds a fish. Nancy Luenn is a talented children’s book writer, who picks colorful words that suggest the river wildlife (like “swish,” “chittering,” “loll,” and even “flapping trout”.) But in the book’s layout, the illustrator hides a special message. Each drawing is inset on the page, surrounded by a frame of the surrounding wilderness. When the sun rises, it’s colorful leaves in the dawn, and when the otters fish, there’s a fish-filled river surrounding the inset picture. It’s a pattern that continues throughout the book, building up to a remarkable image on the final page. A stick in the apple has become a mast, and a leaf turns it into a sail – “a toy for playful otters.” Both the otter and the little boy are shown playing in the river and wrestling in the sand. And as the otters scramble back into their burrow, the boy’s mother calls him into their camp site’s tent. A star-lit sky frames the picture on two facing pages – the otters sleeping in their warm burrow, and the boy snuggling in a sleeping bag. But on the last page, the otters dream contently “of frogs and fish.” And it’s only through the hole of their burrow that the boy’s tent is seen. Almost as an after-thought, the author tells us what he’s dreaming about.